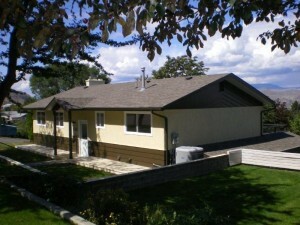 This home is centrally located in the South Kamloops West End, has a 2 bedroom inlaw suite and is close to shopping, transportation and TRU. Everything in this home has been updated, new roof, heat pump, furnace, hot water tank, paint inside & out, all flooring, kitchen appliances (stainless upstairs, white down), all windows, patios, insulation in the attic, bathrooms and the list continues. The two bedroom suite is very inviting and bright. There is a beautiful panoramic valley and river view from the main floor. Oversized windows make this home very bright. There are two 4 piece bathrooms and a 2 piece ensuite. The ensuite can easily be converted to a 3 piece. There is a two car tandem carport with tons of extra storage in the insulated storage room. The large yard it great for a growing family and there is RV parking. Book your appointment to view this home, it won’t last!